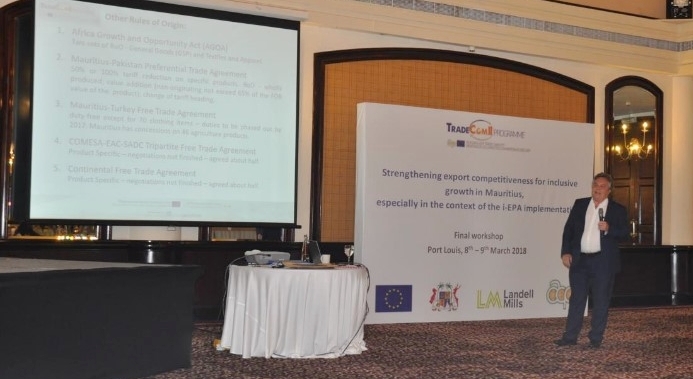 The project ‘Strengthening Export Competitiveness for Inclusive Growth in Mauritius, especially in the context of the implementation of the interim Economic Partnership Agreement (i-EPA)’ concluded with its final workshop on the 8th - 9th March. It brought together trade policymakers as well as representatives of the business community, including a number of Mauritian entrepreneurs who have participated in the project. The project brought together representatives of the public and private sector to discuss the key constraints faced by SMEs who want to export their products to markets such as the EU. It has been delivered in partnership with the Ministry of Foreign Affairs, Regional Integration and International Trade, among other institutions. Throughout the project, 32 participating Mauritian enterprises, often led by women or young entrepreneurs, received 1 to 1 business coaching. This included guidance regarding product quality requirements, Rules of Origin, marketing and business development. By enhancing compliance with international trading standards, the project developed participating enterprises’ ability to sell their products abroad, including in the EU. Training in regional and international market competition was also provided, which developed companies’ understanding of their market and enabled them to identify their Unique Selling Point. The project increased understanding of market competition, enhancing the ability of the participating enterprises to trade more successfully and promoting economic growth in their respective countries. The project was commissioned by the EU-ACP TradeCom II programme, which contributes to sustainable economic development and poverty reduction in African, Caribbean and Pacific countries through closer regional integration and increased participation in the global economy.